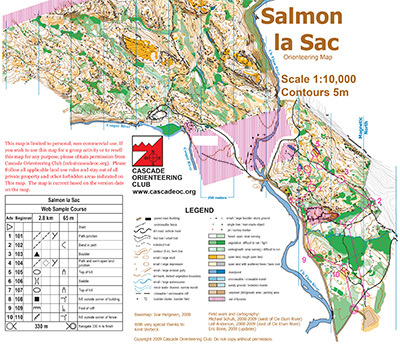 Salmon La Sac is Cascade’s most challenging map of all, both physically and navigationally. 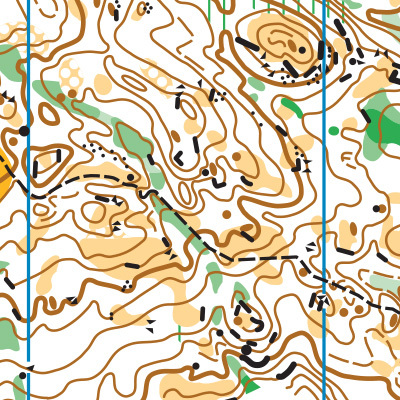 The glaciated terrain produces incredibly detailed topographic features, which orienteers on Advanced courses must rely on, since trails are sparse. Plus, there are hundreds (thousands?) of point features, requiring detailed navigation to find. Add to that, Salmon La Sac is the steepest venue in the Cascade map catalogue, and off-trail travel is rocky and uneven. Salmon La Sac is a beast of a venue, but it is also one of the most beautiful. High points on the course can surprise you with long vistas, and clearings are often bare rock covered in springy moss that you’ll want to stop and have a picnic on. You may take much longer on a course at Salmon La Sac than you could have imagined, but if you bring water and snacks, it will be a welcome adventure. Salmon La Sac features glaciated terrain, which produces detailed topographic features that are a wonderful challenge to navigate. The venue is heavily peppered with point features, including many mapped boulders, cliffs, and knolls. Aside from one major trail running through the heart of the map, there are few trails here, thus requiring significant off-trail travel on Advanced courses. There are some delightful open areas, but also a fair amount of forest which reduces visibility. This is the pinnacle of navigational challenge in Cascade’s mapped venues. Salmon La Sac features the steepest terrain of all of Cascade’s maps. Kind course setters may do their best to avoid excessive amounts of climb, but it is unavoidable. In small select areas, off-trail travel can mean skipping along bare rock covered with springy moss. However, most off-trail travel is uneven underfoot, due to either piles of deadfall or piles of rocks. Vine maple likes to grow in the gullies here. Salmon La Sac is Cascade’s most physically challenging venue. Caution: speed trap. Note the speed limit.